How do you know when it's time for your company to make the switch? Basic payroll and time tracking not cutting it for your business anymore? 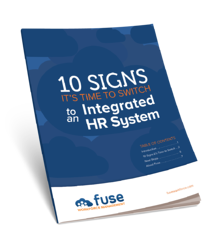 Download our ebook, 10 Signs It’s Time to Upgrade to an Integrated HR System, and know the signs it's time for your company to move from traditional payroll to workforce management systems. Fill out the form, and get your resource now! "Previous to Fuse Workfroce Managment, our payroll and time & attendance platforms were separate, meaning someone had to get the data from time & attendance to payroll every week in order to process paychecks. This usually meant hours of keying of numbers. With the integrated solution Fuse Workforce Management provides, we no longer have this time sink every week."